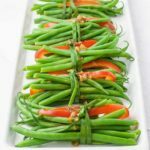 Wrapped with a chive ribbon, these Vegetarian Green Bean Bundles will add a “wow” factor to a special meal. Drizzled with garlic browned butter, they make a spectacular side dish. Keto-friendly. 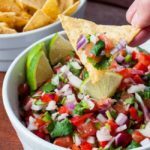 Looking for a showstopper side dish? 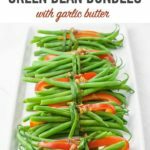 Try these Vegetarian Green Bean Bundles with Garlic Butter! My garden is overflowing with green beans! Why do they all have to ripen at once?! This same scenario replays itself every year and every Spring I plant less, but beans seem to thrive in my garden. 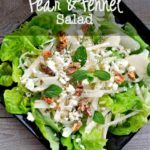 I’ve made these Sesame Ginger Green Beans, this Green Bean Blue Cheese Salad and these Dijon Green Beans with Crispy Potato Chips to try to create some variety in our meals. I’ve even made these Refrigerator Pickled Beans. And there are still MORE BEANS! Today I decided to try something new. 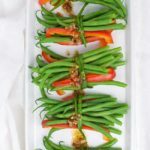 I found a recipe for Green Bean Bundles wrapped in bacon, but I decided to make this recipe meat-free, and these Vegetarian Green Bean Bundles with Garlic Butter were the result! They’re tasty and they make a beautiful presentation. 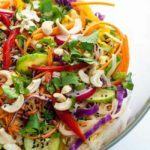 Would I make these for a simple weeknight dinner? Probably not, but for a holiday dinner like Thanksgiving or Christmas, they will make a spectacular vegetarian side dish. Trim the stem end of the beans by snapping or cutting it off. You can remove the tip if desired. I like to leave it on. Lay a long strip of chive (or green onion if you don’t have chives) on your work surface. Divide the beans into serving size bundles, add 3 thin red bell pepper strips to each one. Lay the bundles across the chives. Tie the chives around the bundles with a knot to secure them. Steam for 3 – 5 minutes. Meanwhile, heat butter in a small skillet, add garlic and swirl until butter turns brown. Add a little olive oil. 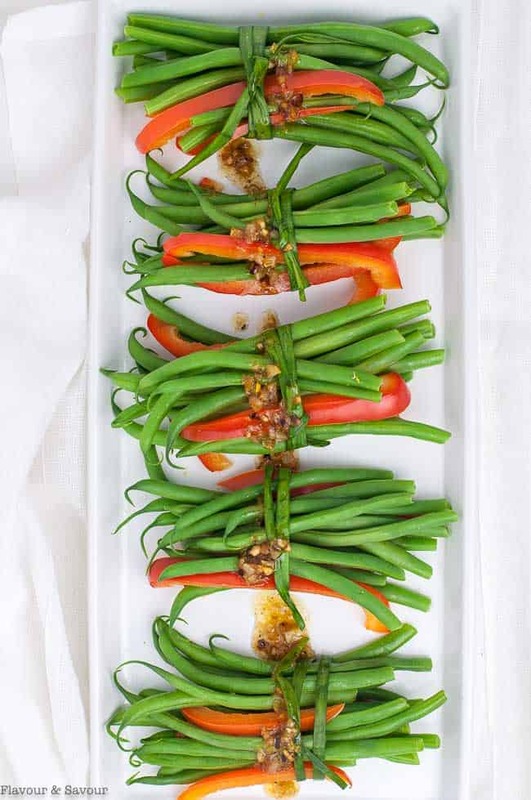 Transfer green bean bundles to a serving platter and drizzle with garlic butter. Serve! 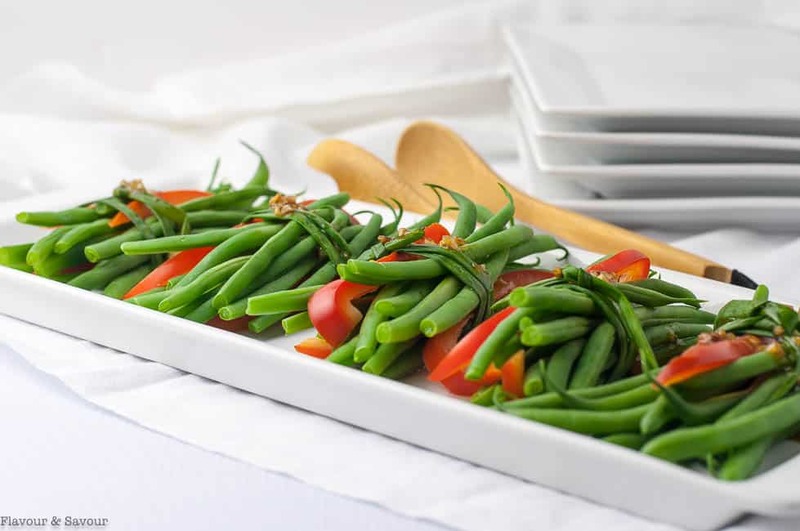 See Recipe Notes below for tips for making these Vegetarian Green Bean Bundles ahead of time. 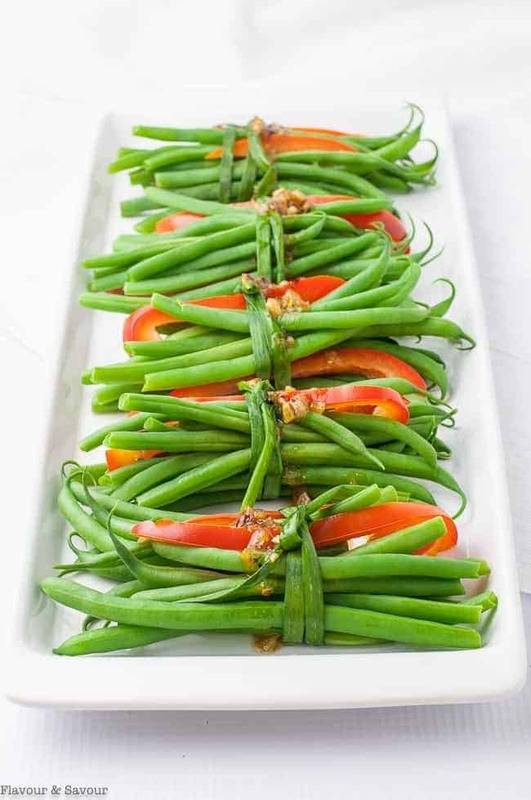 Wrapped with a chive, these Vegetarian Green Bean Bundles will add a "wow" factor to a special meal. Drizzled with garlic browned butter, they make a spectacular side dish. Wash and trim the beans by snapping off the stem end. Divide the beans into 4 portions (about 12 beans each). Lay a long chive on your work surface and place one portion of beans and three red pepper strips across it. Wrap the chive around the bundle and carefully tie a knot to secure it. Bring 1 inch of water to a boil in a large pan with a steamer basket. Steam the bundles for 3 - 5 minutes or until tender-crisp. Meanwhile, melt butter in a small skillet. Add the minced garlic and swirl just until the butter browns, about 2 - 3 minutes. Add olive oil. 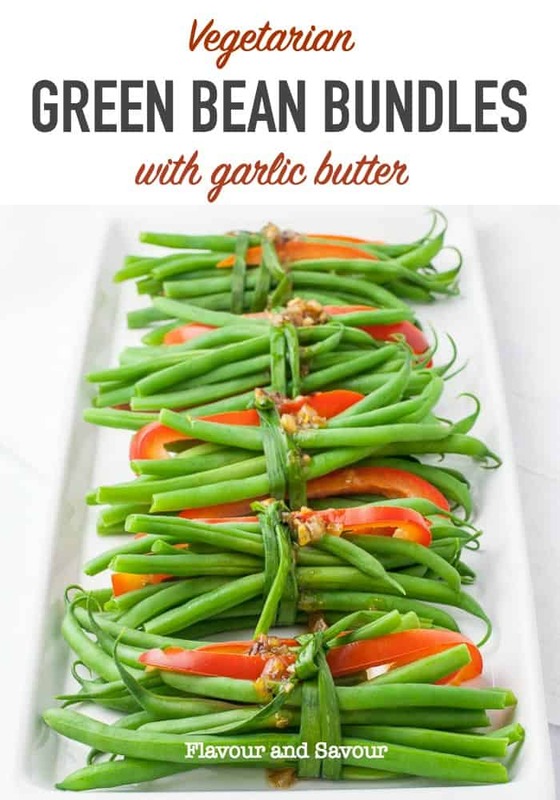 Transfer green bean bundles to a serving platter and drizzle with the garlic butter. Serve immediately OR keep the steamed bundles warm in a low oven (225°F) for up to 20 minutes and add the warm garlic butter just before serving. 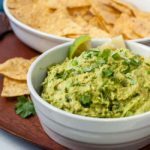 This recipe was adapted from Olive Oil Market Place . This reminds me of the ‘veggie bundles’ I used to have to make while working at the Prince George Hotel in Halifax! These were part of some buffet menus as a vegetable side, and as such I’d have to prep HUNDREDS of them! The difference was ours included carrot, beans, various peppers, and were wrapped in a carrot ribbon. A real pain when you had to make over 200 for a single evening!!! A great experience in patience and consistency though!! A little fiddly, but fun for a special dinner! Thanks Markus! Thanks Denise! I’m planning to make these for Thanksgiving dinner. How did you know that’s my favourite movie?? Had a good laugh at your comment! Thanks! Have always eaten green beans. Made these bundles for Christmas…was a favourite with everyone. That’s great to hear, Deanne. I’ll bet they looked beautiful with your Christmas dinner! Thanks for letting me know.